Since my last Coffee Journal entry I’ve had some palate pleasing coffee experiences and as I sip my Friday morning coffee (emergency Starbucks Via – Italian Roast in my office at work) I’m writing this entry…On 11/12 (and again on 11/23) I had a dentist appointment on the lower east side of Manhattan and upon a friend’s recommendation checked out Madman Espresso (319 E 14th St, New York, NY 10003). Madman serves coffees from Caffe Vita both as pour over and in their various espresso-based drinks. When I first went there on the 12th I enjoyed a pour over of their Theo blend, which was quite straight forward tasting with hints of chocolate and an herbaceous quality woven into an otherwise generic darker roast coffee character. What saved my first visit was the macchiato that I got along with the Theo pour over. The espresso flavors were rich, chocolaty, and finished with a hint of fruity acidity and were blended quite well with just the right amount of steamed milk. Also, the barista was quite welcoming and open to chatting about specialty coffee and the rotation of single origin and blend coffees that come through this Madman location. Before leaving to head to work I ordered a second macchiato to go because I wanted to continue savoring my experience for just a bit longer…When I went back for my second visit I was happy to be told that the pour over coffee of the day was single origin Kenya AA and I quickly ordered it. Being that I’ve slowly become familiar with Kenyan coffees I was pleased to taste and smell notes of berries, candied citrus, and toffee. Before leaving I ordered a macchiato to go and for some reason it didn’t taste the same as the first two that I had in that it was nuttier and not as bold tasting. Next I go there I’ll have to ask if they also rotate which coffees they use for their espresso-based drinks. On Sunday, 11/15 I went with my wife to check out yet another NY coffee roaster named Irving Farm Coffee Roasters. The upper west side location that we visited was quite busy which took away from my preferred quiet coffee drinking atmosphere, but I was able to grab seats and then get in line to order my usual pour over and macchiato. For my pour over I chose El Molino, El Salvodor, which although it wasn’t as bold as some of the Ethiopian coffees that I’ve had, lived up to its cupping notes with flavors of dried Apricot and molasses along with a hint of almond in the finish. The macchiato was good, but not exceptional in that it didn’t have any flavors that made it unique…I’d like to visit either Irving Farm again at a time when this or one of their other locations isn’t as busy in order to have the full/quiet coffee shop experience I’ve come to enjoy. 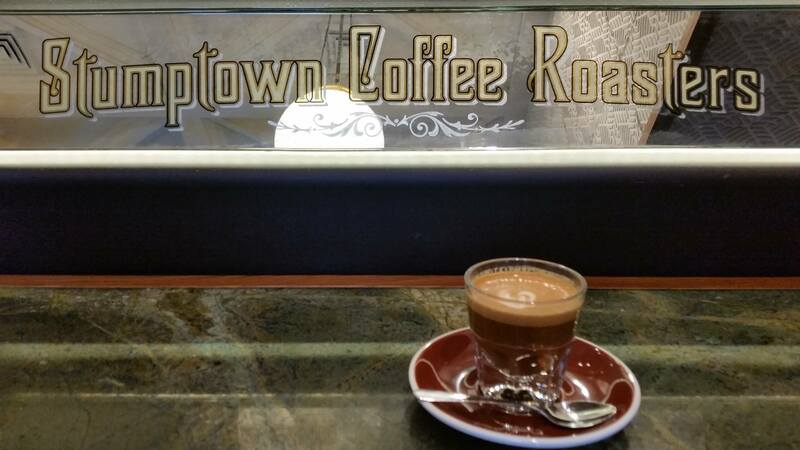 Lastly on Thursday 11/19 I once again went to Stumptown Coffee Roasters’ West 8th Street location to buy some beans and have my usual pour over and macchiato…Instead of going for an African coffee I decided to try Marvin Robles, Costa Rica , a barista’s recommendation. True to its cupping notes it had a great aftertaste of rainier cherries. Since Stumptown always has a large variety of single origin coffees in stock I’ll definitely be continuing my efforts to venture out of my African coffee comfort zone and try coffees from Latin American countries such as Costa Rica and Guatemala. Current coffees: Stumptown Ethiopia Duromina and my friend Merlin’s whisky barrel-aged coffee. This entry was posted in Uncategorized and tagged beer and dessert pairing, Caffe Vita, cupping notes, Kenya AA, Madaman Espresso, NYC coffee, Stumptown Coffee. Bookmark the permalink.